Oscar-winning actor Russell Crowe showed up at an eclectic auction of some of his prized possessions and film memorabilia in Sydney on Saturday, apparently as a way to come to terms with his divorce. Clients shelled out hundreds of thousands of dollars to buy a mix of 227 intriguing items up for grabs at the event held at Carriageworks, a railyard-turned-art centre. “This item is dear to my heart … It was made by the patriarch of the company,” said Crowe, before the bidders were to hear a recital of a piece from the film by two young musicians. The violin fetched 135,000 dollars (103,000 US dollars). The event, titled “The Art of Divorce,” falls on Crowe’s 54th birthday, as well as the day he got divorced from his wife of nine years, Danielle Spencer. The event was a year in the making by Crowe as a way to deal with the end of his marriage, after he and Spencer separated in 2012. The event was also broadcast on Crowe’s Facebook page. Earlier in the evening, costume pieces and props from his film “Gladiator” fetched tens of thousands of dollars. Stunt armour worn by Crowe when his character Maximus died in the film was expected to fetch up to 30,000 dollars. An unknown online bidder bought it for 125,000 dollars. 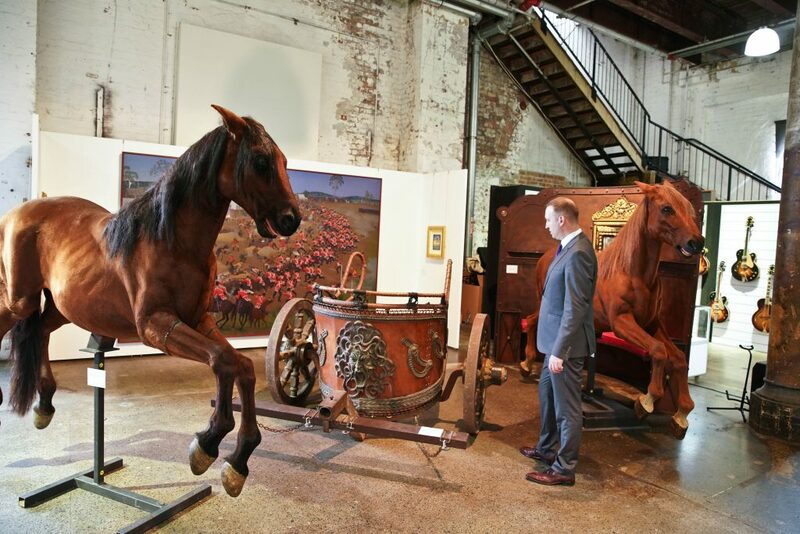 A replica Roman chariot was sold for 65,000 dollars, while its two life-sized prop horses went for 5,500 dollars each. A pair of black leather wrist cuffs was snatched for 32,000 dollars. Even the wooden training sword fetched 20,000 dollars. Crowe’s brown leather jockstrap, or boxer’s protector, from the film “Cinderella Man,” estimated to fetch 500 to 600 dollars, was sold for a whopping 7,000 dollars. Its telephone bidder is unknown. A leather pair of Dr Martens boots from an earlier movie, “Romper Stomper,” was purchased for 10,000 dollars. One of the most expensive items sold was the 1960 Charles Blackman artwork “The Suitor,” which sold for 360,000. A 1986 Grammy Award that was jointly presented to Johnny Cash, Carl Perkins, Jerry Lee Lewis, Roy Orbison, Sam Phillips, Rick Nelson and Chips Moman sold for 150,000 dollars. It wasn’t clear how much money Crowe raked in, but according to estimates, he was going make anywhere between 2.6 to 3.7 million dollars. Auction house Sotheby’s conducted the bidding process. It would receive a 22 per cent commission, which the buyers have to fork out on top of the bid money.